Gorilla Grabber: A reach-extending grabber that looks like a gorilla’s paw. Leaning over is for suckers. Real geniuses use the Gorilla Grabber to extend their reach by over 18 inches while staying relaxed (and cracking up their friends). 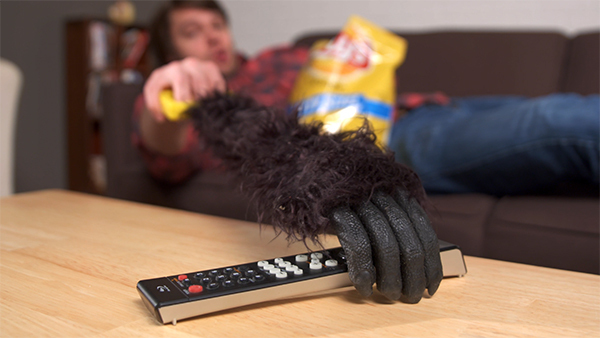 Squeeze the plastic handle to curl the paw’s four fingers and envelop your TV remote, stapler, or lunch mate’s banana in a gorilla handshake. Like any confident ape, the Gorilla Grabber has a firm grip (aided by the plastic frame underneath the rubber paw) to successfully retrieve your object. This silly simian toy is a fun accessory whether you want to maximize your laziness or entertain yourself and others throughout the day. If you want to grab the remote off the coffee table without getting out of your reclined position, this monkey’s paw will grant your wish (and without any cursed irony)! The Gorilla Grabber adds over 18” to your reach so you can avoid the dreaded alternative: having to get up. Or you can use the monkey arm to surprise friends, give out hairy high-fives, and engage in any other goofy activities you can think of. 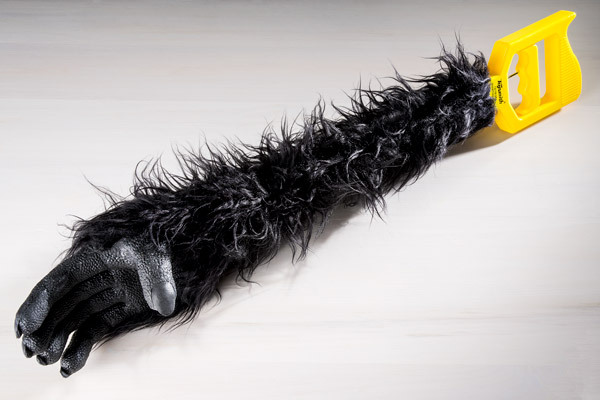 The Gorilla Grabber is a silly toy made with serious quality. It may not have primate strength, but it’s strong enough to lift most handheld objects around the house. The fake fur is fairly convincing while the the textured rubber of the fingers adds realism (and extra grip) to your grabber. King Kong ain’t got nothin’ on this toy. Realistic fur and 18” reach! Question: Can I throw things with it? Answer: Yes. With a little practice, you can throw small objects with your Gorilla Grabber (especially if it’s species appropriate). Question: Am I really expected to pick things up with this? Answer: The Gorilla Grabber is capable of dramatically making your life slightly easier. However, we find it best suited for jokes and general goofing around.